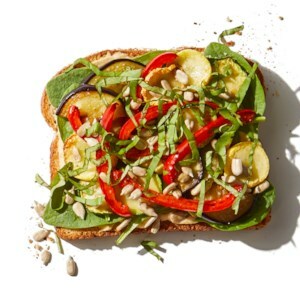 Find healthy, delicious vegan sandwich recipes, from the food and nutrition experts at EatingWell. A pinch of ground cardamom punches up the flavor in this classic combo of apples and peanut butter on toast. Spruce up your sandwich game with a medley of roasted veggies. For extra vegetables throughout the week, roast a whole sheet pan in Step 1, then add the cooked veggies to salads, sandwiches, and pasta dishes, or serve them as a side dish. 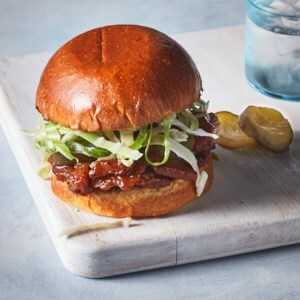 Enjoy classic BBQ flavor with filling vegan seitan, or wheat meat. The sliced seitan needs time in a hot pan to turn brown and crispy; let it sear before coating it with the tangy ketchup mixture for the best texture. A side of sweet potato chips makes the perfect pairing for a fast weeknight meal. 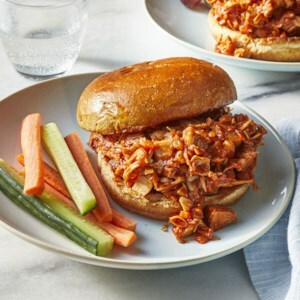 In this vegan copycat recipe of barbecue pulled pork, we swap out meat for jackfruit, a tropical fruit that, when not fully ripe, has a texture similar to shredded pork. The mild-flavored fruit soaks up the delicious homemade barbecue sauce for a finger-licking-good sandwich filling. 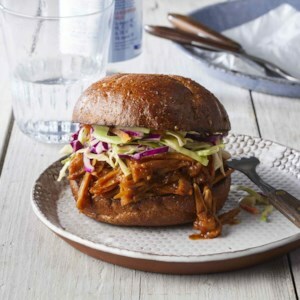 Top the sandwiches with a fresh slaw for a satisfying meal. Swap out a typical bagel with a mini whole wheat bagel for a lower calorie and higher fiber breakfast. Pair with peanut butter to keep you fuller longer. 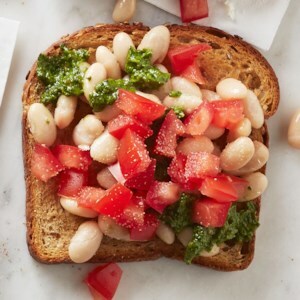 This tasty snack is topped with chopped tomato and basil pesto. The title says it all! 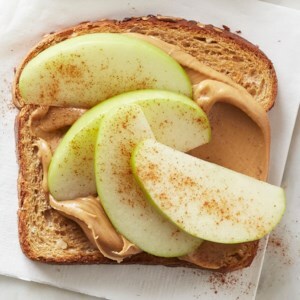 This peanut butter and apple-cinnamon topped toaste is sure to satisfy for breakfast of a snack. 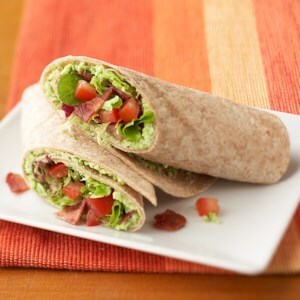 This hearty wrap offers all the wonderful flavors of a BLT with extra protein from the soybeans and extra kick from the jalapeño pepper. 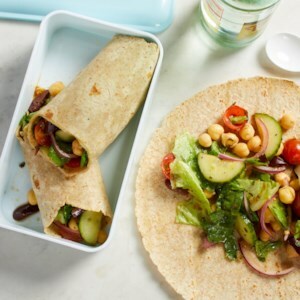 Zesty Greek salad packed with tomatoes, cucumber and olives--plus chickpeas for a protein punch--gets tucked into a whole-wheat wrap for a healthy vegan lunch that's easy to pack for work. It's so flavorful and satisfying, you won't miss the feta! Peanut butter and banana are the original power couple. 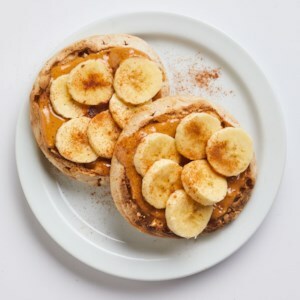 Top a simple toasted English muffin with the duo, then sprinkle everything with a hit of ground cinnamon for a healthy breakfast of champions. 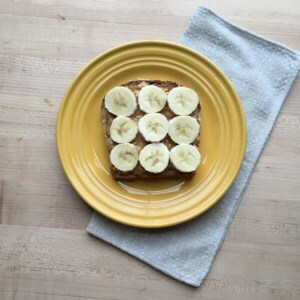 Creamy peanut butter and bananas are the key ingredients to this quick and easy breakfast. Roasted shiitake mushrooms doused in soy sauce with a dash of smoked paprika become a natural, vegan alternative to bacon. 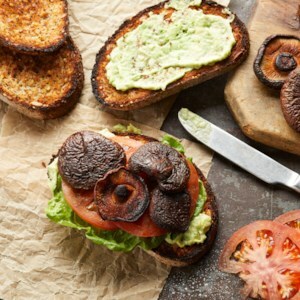 Try them in this vegan version of a classic BLT with creamy avocado and eggless mayonnaise or on top of a salad as a substitute for bacon bits. 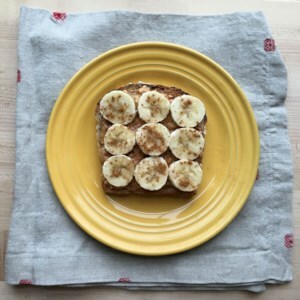 This satisfying peanut butter-banana toast gets a sprinkle of cinnamon for an extra flavor boost. Jelly is delicious, but nothing beats the natural sweetness of a nutritious banana. 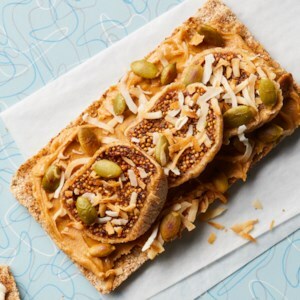 It's the perfect addition to creamy peanut butter and a crisp slice of fiber-rich toast. 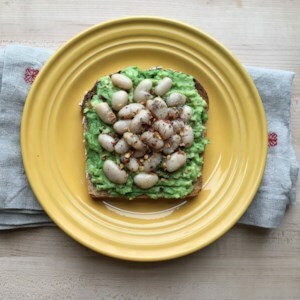 Mashed avocado and white beans make for a fiber-rich and creamy topping, the perfect partner for a crispy slice of toast. Try it for a quick breakfast or snack. 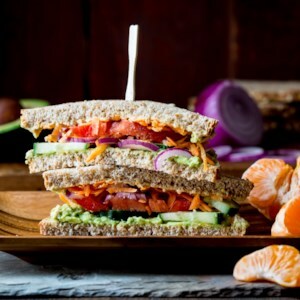 There's no chance of getting the afternoon munchies when you fuel up with this vegan veggie sandwich filled with fiber and healthy fats, plus fruit on the side. It'll keep you energized until dinner. Feel free to swap in your other favorite sandwich vegetables, sprouts or greens. This mile-high vegetable and hummus sandwich makes the perfect heart-healthy vegetarian lunch to go. Mix it up with different flavors of hummus and different types of vegetables depending on your mood. Eating fiber-rich rye crisps (or rye bread), such as Danish open-face smørrebrøds, at breakfast (instead of white bread) may help you feel satisfied longer and help keep blood sugar levels steady. This version is our take on a healthier PB&J. 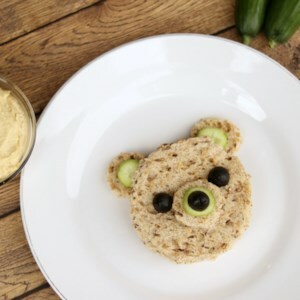 You don't need any special tools to create this cute teddy bear sandwich that kids will love. Plus, this easy lunch has healthy ingredients you can feel good about feeding your kids, like whole grains, hummus and veggies.